Workers at the University of Cape Town (UCT) and the Wits University have been protesting against ill-treatment and the way certain workers have been excluded from insourcing measures. On Monday, students and workers protested against the exploitation of Jacobs Partitioning workers at UCT. Tim Wolff-Piggott, a member of the Disrupting Whiteness movement at UCT said workersâ€™ constitutional rights were being violated. Shafiek Jacobs, the owner of Jacobs Partitioning, would not comment on the allegations without a legal representative. He said that he has acknowledged the demands from the students and confirmed that he is entering into negotiations with the students and workers. UCT is not the only university campus experiencing protests from unhappy workers, though. 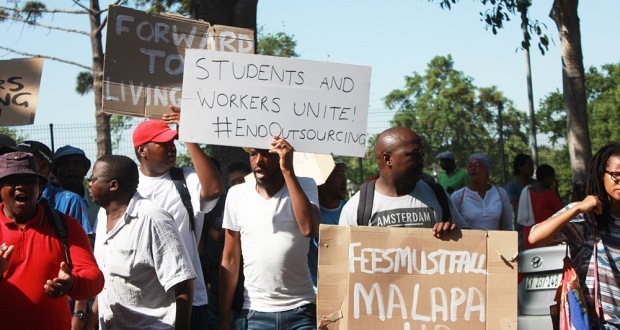 Late in May, workers at Wits protested over the insourcing process at the university. Deliwe Mzobe, a worker at the university, said that those staff who were unhappy with the insourcing decision had decided to strike.The workers from the stores and restaurants inside the retail centre, The Matrix, also wanted to be insourced and for their salaries to be increased. â€œThey are not happy about this outcome, hence they decided to carry on with the strike. They demand that they also want insourcing and top ups,â€ she said. During 2015â€™s #FeesMustFall protests, Wits formed the Insourcing Task Team (ITT), consisting of workers, students and academics. Its mandate is to investigate the ways in which insourcing can be achieved at the university. The chairperson of the ITT, Professor Imraan Valodia, said their understanding of the strike was that the workers were unhappy about certain proposals made by the task team. The allowance that was increased did not apply to the retail workers, so not all workers at the university have benefited from the insourcing process. Valodia said that the task team is busy finalising a report to the universityâ€™s Council with recommendations on who qualifies for insourcing. The excluded workers from Matrix have set up their own task team that will represent them and they have been incorporated into the ITT. This came after the workers met with the management on May 30th. Prof Valodia said that he could not share the outcomes of the meeting with the workers and management since it is still under investigation. The Insourcing Task Team had a deadline that insourcing was to take place by the 1st of June. When asked about the deadline, Valodia said that the functioning of the Insourcing Task Team, timeline and insourcing as a whole were different matters. Simone received her BA Honours in Political Studies from UWC. She's very inquisitive and always keen to learn. South African politics is by far her favourite.